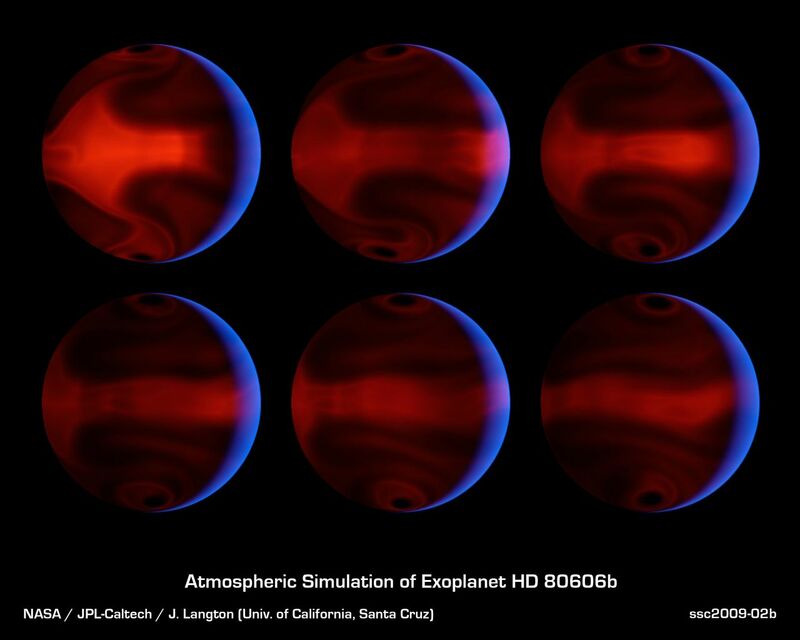 These computer-generated images chart the development of severe weather patterns on the highly eccentric exoplanet HD 80606b during the days after its closest approach to its parent star. An exoplanet is a planet that orbits a star other than our sun. 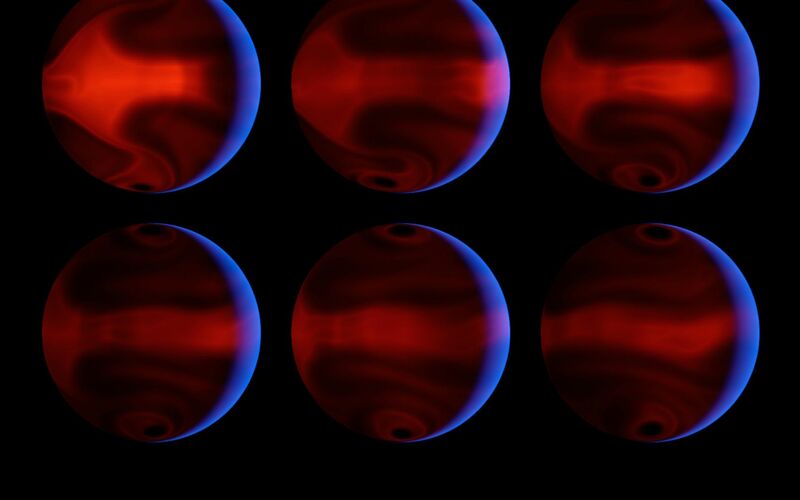 The images were produced by computer simulations that modeled NASA's Spitzer Space Telescope's measurements of heat radiating from the planet. The six frames are evenly spaced in time, starting from 4.4 days after the planet's close approach to the star, a moment known as "periastron," and running through 8.9 days after periastron. The blue glow of the crescent is starlight that has been scattered and reflected by the planet. The starlight appears blue because the planet is a very efficient absorber of red light. The night side appears reddish orange as it glows with its own internal heat. 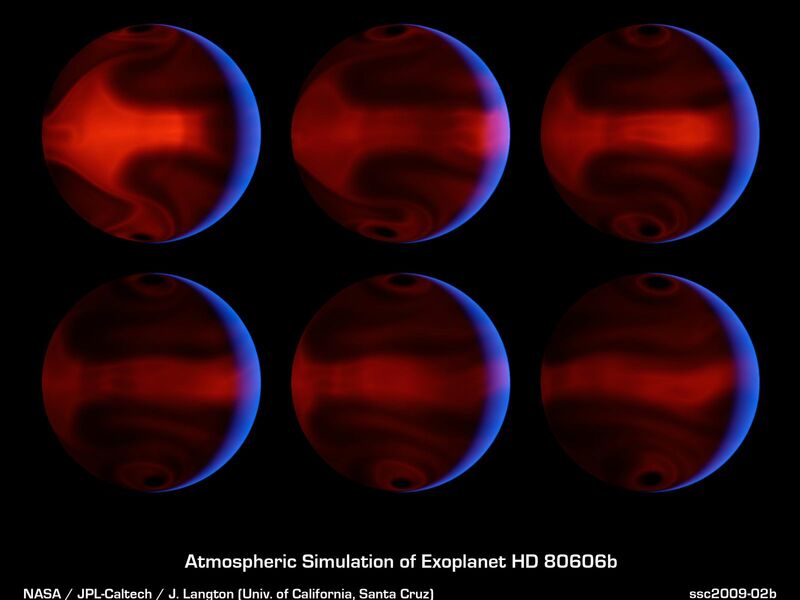 These theoretical models allow astronomers to better understand weather patterns on distant planets. While direct telescopic observations of the atmospheres of such worlds may be many decades away, such simulations give us a clue to what we may see when it becomes possible. The Spitzer observations themselves spanned the relatively brief period when the heating of the planet was most intense, running from 20 hours prior to 10 hours after periastron. The data were taken in Nov. of 2007. HD 80606b is located 190 light-years away in the constellation Ursa Major. Its star can be seen with binoculars.